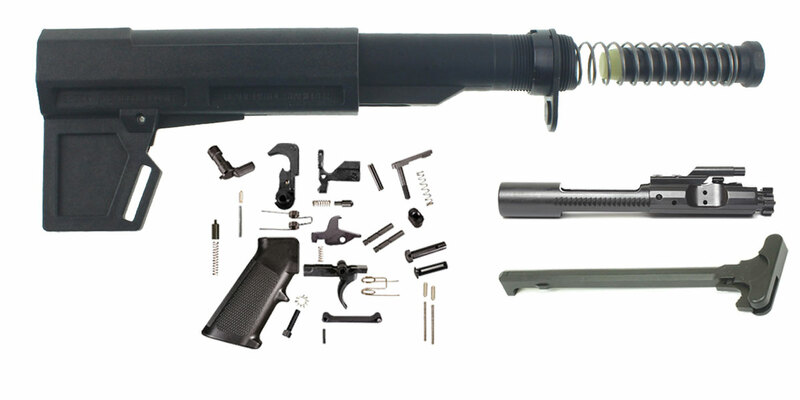 A basic AR-15 lower parts kit. It includes all the small parts needed to complete your lower. You will just need a stock kit and an upper. This kit includes a standard right hand safety selector. Fits both Commercial and Mil-Spec tubes. It's always good to have a spare! If you are in need of the 6-Position Aluminum 7075 T7 (buffer tube) Machined to Mil-Spec dimensions, we offer it separately. No other parts included, just the tube. M4-style receiver plate includes the engagement tab required to align the buttstock and buffer tube with the lower receiver on carbine models. Precision, fine blanking process ensures precise edges and superior flatness for correct fit and solid installation. This pistol stabilizer brace is made from high strength glass-reinforced polymer. The adjustable Blade 2M pistol stabilizer has been made to exacting tolerances and is able to fit all pistols equipped with a Mil-spec buffer tube. Easy to install, just slip it on and lock in place, this pistol brace adjusts with a simple finger lever. Made in the USA and designed by veterans, this brace is approved for use by the ATF as well. Fits all pistols equipped with a Mil-spec buffer tube: AR-15 pattern, MPX, Glock, CZ Scorpion Evo 3, HK9X pattern, etc. Provides additional support during firing. Made of 9310 steel then Nitride finished at the world class facility H&M then MPI and HPT inspected for extreme safety. This is one of the highest quality BCGs made. This Buffer Is A Three Weight Assembly With Rubber Inserts Between Each Weight. Very well made, Super Quiet, Hard Black Anodized Finish, And Yellow Bumper.